Massey Ferguson FE35 23c Engine Overhaul Kit. Top Quality Exactly as picture with finished liners ready to fit. All major Credit/Debit cards accepted. This Kit Contains the Following. 4 x FE35 23C Piston Ring set. 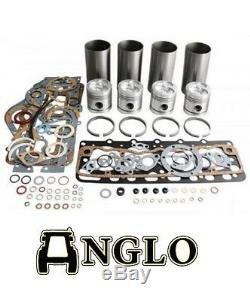 1 x Lower Gasket Set. 1 x Top Gasket Set. 1 x Rear Crank Seal. 1 x Front Crank Seal/Timing Cover. Please note that OEM Numbers are for cross reference purposes only and do not imply that original parts will be supplied (unless stated). 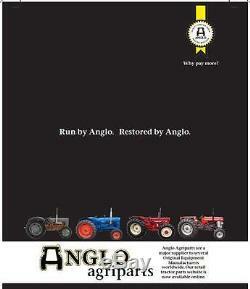 The item "Massey Ferguson FE35 Engine Overhaul Kit Tractor 23c Diesel Rebuild Fergie" is in sale since Thursday, October 23, 2014. This item is in the category "Vehicle Parts & Accessories\Commercial Vehicles Parts\Agricultural Vehicles\Agricultural Vehicle Parts". The seller is "angloagripartstractor" and is located in Selborne. This item can be shipped to North, South, or Latin America, all countries in Europe, Australia.